I completed this quilt (a pattern called "Tiger Lily" published in Quilt Sampler 2001) a very long time ago...but I just now finished putting on the binding. 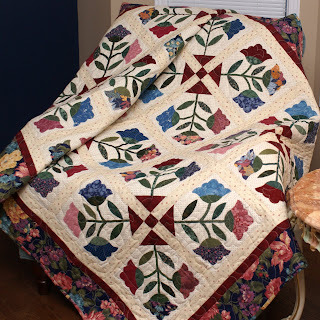 It always take me such a long time to get around to sewing the bindings on my quilts. Your Tiger Lily is gorgeous! I have this pattern on my to-do list .... one day.